Because you need to walk before you can run. Even expert Cinema 4D guys will get a nice refresher course in where things are.Although people say that a tool will always be a tool, Cinema4D stands out in the crowd to be one of the greatest and most powerful 3D software's around. With this first volume we will have the pleasure to introduce you to it. This training presents logical instruction that has solid researched and tested information for all levels of artists wanting to start, migrate or integrate it in the day to day business. It offers detailed, practical information that goes beyond mere theory. You will achieve the ability to start your own projects inside Cinema 4D with confidence. Each project you start will be accompanied by one of the best renderers and user interface experiences on the market. Like any good craft, you need the right tools in your hand to bring your ideas to life. Since the begging of computer graphics, people search for the right elements to start their own projects. In this volume we will talk about the robust tool set inside Cinema4D and how they can help you turn your ideas to reality. Geometry, lights, deformers, bones and sound setup workflow's are all covered topics accompanied by in-depth notes with real life tips and tricks. The Tool Sets from Cinema 4D are one of the most extensive libraries in the Computer Graphics Market. We will show you how to create whatever your heart desires. Master the tools to orchestrate gorgeous 3D artwork. To build a strong house that can stand up to strong wind, you must have a strong, deep base. The same idea applie to workflow. Here you will find precious information that can build you into a strong C4D artist. A substantial effort has been made to create detailed training covering modeling, scene rigging, UV sets and shading. Its a major leap forward in training for photorealistic recreation of subject matter. 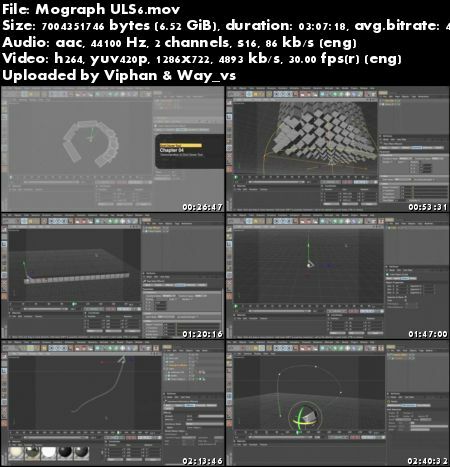 This Volume sets off the continuity of the previous volumes in the Cinema 4D Ultimate Learning System. At this stage, we can bridge the gap from concepts to final execution. You will find out that beauty comes with the responsibility of organized thoughts and a good knowledge from all aspects of the software.Because of the vast information inside this volume, it is important for you to know the content from the previous Volumes to be able to take full advantage of higher levels of detail and final deliveribles. It is extremely important that you are very comfortable with all aspects of the interface to make the best of this information. Don't be an observer. Be a creator and use our in-depth descriptions to actualize your visions without fear. One of the greatest achievements in computer graphics was the ability to bring life to your creations by giving them movement, feelings and personality in a way that mimics real life. In this Volume, you will have the chance to absorb all the necessary information to start your animation projects. It is not about the principals of animation, it is about getting you speaking the animation language from Cinema4D so you don`t waste time looking for things. Navigate directly to the information you need to help you with your project. As with every other aspect from Cinema4D, animation stands out with excellent control over your scene. C4d give you the freedom to create and go wild when working with simple or complex situations. There are numerous powerful animation features in the Cinema 4D animation system, and we will guide you through them. What's left to do after putting your heart and soul into designing, modeling, UVing, texturing, animating, and lighting? The answer is rendering! Now it is time to put all your efforts into an image or sequence of images. This is where the end of the line is for the CG artist and the post processing begins. Your skill level will determine how much post is actually necessary. With the best collection of scenes on the training circuit, you will learn how to take full advantage of the most desired features apart of the Cinema4D render engine. Create your scenes with fearlessness. Explode the realm of possibilities and then let cmiVFX show you how to optimize your scenes for fast, accurate, life-like renderings.Learn how to get crystal clear renders without flickering. Often, we see that in GI or Caustic Effects. Control everything with precision by learning what all the settings do. We will help you expand our horizons and set your creativity free, without the weight of technological monkey on your back. 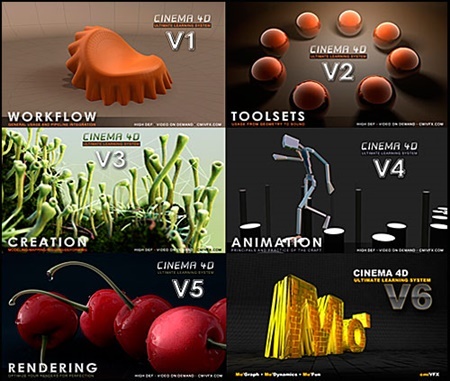 cmiVFX C4D Ultimate Learning System Complete Series Vol 1-6 from rapidshare mediafire megaupload hotfile, cmiVFX C4D Ultimate Learning System Complete Series Vol 1-6 via torrent or emule, full free cmiVFX C4D Ultimate Learning System Complete Series Vol 1-6, cmiVFX C4D Ultimate Learning System Complete Series Vol 1-6 rar zip password or anything related.